The longleaf pine forest is a fundamental component of the cultural and natural history of North Carolina. They were once one of the most extensive ecosystems in North America. The historic range of the species stretched from Texas to Virginia, covering approximately 90 million acres. In North Carolina, longleaf pine forests covered nearly all of the upper coastal plain and lower piedmont. >Early explorers described the longleaf forest as a vast, open, park-like savanna of long-needled pine over a diverse understory of grasses and other plants. Frequent fires caused by lightning strikes shaped the longleaf forest for thousands of years, resulting in a unique home for many plants and animals that require the habitat created by fire to survive and thrive. In the eighteenth century, naval stores (tar, pitch, and turpentine used in shipbuilding) made from the abundant pine resin of longleaf trees were the colony’s most important industry. Additionally, longleaf was harvested for its dense, strong wood and was used to construct many of the South’s cities and towns. Most often, cutover longleaf forests were replaced by farmland or other forest types due to a lack of knowledge of how to regenerate the longleaf forest. By the early 2000s, less than 3% of the historic acreage of longleaf pine forest remained. 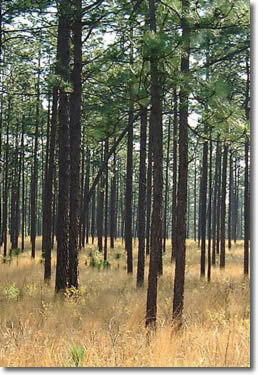 In 2002, North Carolina had approximately 293,000 acres of longleaf pine forest remaining. Due to its value as a home for a diverse collection of plants and animals as well as its value as a source of high-quality, sustainable forest products, many organizations, including the North Carolina Forest Service (NCFS), have made increasing longleaf pine forest acreage a top priority. A longleaf pine forest is well-suited for the woodland owner who wants to manage for multiple uses including aesthetics, wildlife, recreation, and forest products (timber, pine straw). Whether you are a tree farmer, a hunter, a hiker, an environmentalist or a combination of these, you can enjoy the many superior qualities of a longleaf forest. Contact your county forest ranger if you're interested in managing your land for longleaf pine.